Believe it or not, fall is upon us here in San Marcos, and with it comes one of the most widely celebrated holidays in the United States. Halloween will be here before you know it, and it may be beneficial to your child’s dental health if you have helpful information about some of the candy that he or she is likely to receive when out trick-or-treating. In today’s blog, we’ll review some of the most common Halloween treats and how they can impact your child’s teeth, and we’ll provide a few tips for a healthy Halloween! Following all of those sugary treats, be sure to make an appointment with the Top Rated Local® dentist in San Marcos! The fun, friendly staff at Alligator Dental are happy to be your partner in your child’s dental health, and we’d love to schedule a cleaning for him or her. Call us at 512-393-3500 today! If you’ve ever wondered about how some of the more popular Halloween candy can affect your child’s teeth, you’re not alone! Below, we’ve provided a rundown of some of the more common treats. Because this type of candy is so hard, it presents a large risk for cracking or breaking teeth if chewed wrong. Beyond that, we tend to keep this type of candy in our mouth longer than others. This means that teeth are exposed to sugar-filled saliva for longer periods of time than they are with other goodies. If you allow your children to have hard candy, it’s important that they don’t chew on the candy and they take frequent breaks from keeping the candy in their mouth. Because of their easy preparation and fun, whimsical nature, popcorn balls are a popular choice for Halloween treats. While they are delicious, they also contain sharp husks that can cause trauma to sensitive soft oral tissue, and they are notorious for getting stuck in between teeth. Additionally, the popcorn balls may also contain hard, unpopped kernels that present the same risks as hard candy. Be sure to have floss on hand with this treat! If you have children that have had any kind of fillings or have braces, beware of the sticky Halloween candy that frequently makes its way into trick-or-treat bags. This type of candy tends to stick to the surface of teeth, which can cause damage to many types of dental appliances and fillings. Additionally, the longer it remains on your teeth, the longer your teeth are exposed to the sugar and cavity-causing bacteria. While the phrase “healthy candy” seems like a misnomer, it there is one form of candy that is the safest for your child’s teeth this Halloween, it is chocolate. Because it brushes off of your teeth easier than hard or sticky candies, its sugars don’t stick around your mouth for as long as other treats do. Beyond that, dark chocolate has less sugar than other types of chocolate, making it an even better option for Halloween treats. Our teeth are extremely sensitive to substances that are highly acidic, and anything that has a high acid content can weaken the hard enamel on the outsides of our teeth. 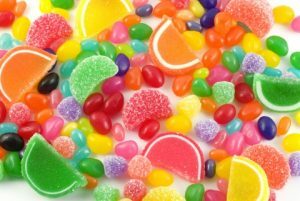 Considering that many sour candies are also packed full of sugar and may be either hard or sticky, this type of candy delivers a powerful one-two combo of terror for teeth, making them more susceptible to issues like cavities. Time for Your Child's Dental Cleaning?Schedule an Appointment Today! Accept Halloween candy with caution and always inspect treats before consumption. Eat candy with or shortly after a meal to allow for increased saliva to cancel out acidity and wash away food particles. Consider donating a good portion of your children’s stash to prevent keeping candy around for months on end. After eating candy and other Halloween treats, be sure to brush and floss teeth thoroughly. 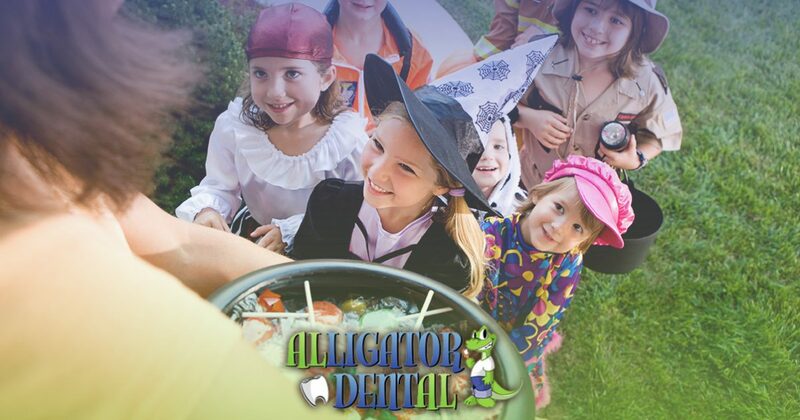 Halloween can be a fun and exciting time of year for kids, and the team at Alligator Dental wants to do everything we can to ensure your child’s dental health doesn’t suffer after the holiday. If you’re looking for a reliable childrens dentist in San Marcos, contact us! Our office offers a fun, exciting environment for kids, and we’d love to meet you. Call 512-393-3500 today to schedule your child’s appointment!